So here is a try of something I have wanted to do for a long while and with totusmel blog and tat-ology's encouragement, I gave it a whirl, Armenian lace. I can't see very well and skiped spaces and not sure if I like it. 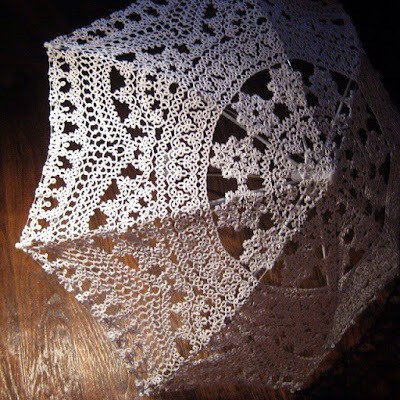 I found this link that has many different kinds of Needle Lace Introductions Beside is a different style, the link is above. This is an outdoor train that they decorate for Christmas time that is beautiful to see with the lights at night too! Pansy's with Priscilla For Pinterest Challenge! I still haven't done as well with this as I would like, in color and tatting but I really feel attracted to this and will keep trying. This is a free pattern available Antique Pattern Library page 20 click on colored words to above for pattern. I feel the yellow in the middle was not enough and so I added a set of 4 rings for the middle. Check out Margaret and Suzanne blog too to see there challenge projects! This last row took 1 hour and 20 mins to make one out of ten half round, the last 5 was 1 hour and 10 minutes. This is size 40 from Handy Hands, Lizbeth 698. I will be using these shuttles from here on. They are wonderful slick and sturdy, and hold tons of thread that will not unwind, I ordered the larger shuttles offered, and to go all way round I filled once, and used a tad bit on the second fill up as you can see. click on David Reed Smith for more information. Oh yea I got new boots that are very comfortable we do hike around twice a month. I don't have room to just lay this around so I fold it up like this. Row Called the "Bakers Dozen"
A sigh of relief, less to remember with this row. Peaceful tatting in the early morning hours. Well it is starting to go faster once I memorize the numbers after the 3rd one repeat. It is getting so large can't take picture of details with out loosing part of the doily. doily !!!! or Large napkin. So now there is another suggestion for all who don't know what to do with it when finished! The magazine is called "Moje Robotki" in polish this means My needle work, for it has many kinds of fiber arts in it. It came out small with size 80. I had fun with the 3 shuttles and colors. I did make a mistake and kept it in. If you cant see it it is the extra outer purple rings in center edge, so I tipped them up when I pinned it to dry. Monster Doily round 12 has begun :) I am taking my time with this round, there are many picots and changing counts. I am starting another 3 shuttles from Fujito. It starts with an onion ring.I really don't mind this now that I think I figured out what length to make the beautiful one strand crossovers. This motif has some flowers made separately. The three colors used are white and variegated color and light purple. I really don't mind this now that I think I figured out what length to make the beautiful one strand crossovers. Its the size of the little onion ring and so far it is working! This seems to be going faster than round 10, not sure why.